Even if it supports sli makes no sense to go for it! 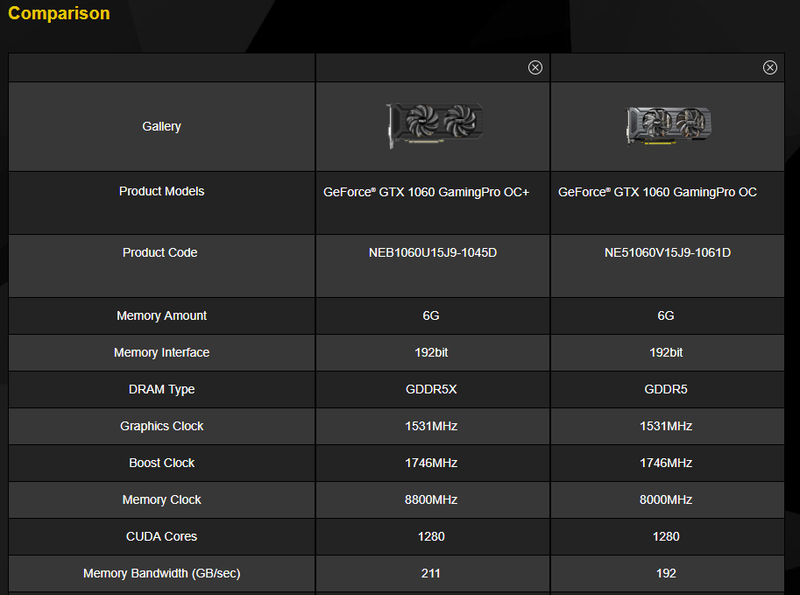 A 2070 or 1080 will give the same perfomance or better at close cost or cheaper! And always no fidling with drivers waiting /praying developets to implement it and if they do pray it is good . GDDR5X chips surplus? Will this small increase in bandwidth bring any noteworthy performance gains? there are to many configurations of cards happening or is just me? This card doesn't make any sense to me they already boosted the gddr5 speeds by 1ghz and it made little to no difference in performance and now they're throwing gddr5x and charging a small premium compared to whats already available they should just drop prices and be done with it. That would make zero sense. Well that's a 10% increase in memory bandwidth. I've just now run my GTX 1070 with a 10% VRAM overclock and I'm seeing a 3% increase in Graphics Score in Timespy and a 3.5% increase in Firestrike. One thing to bear in mind is that the GTX 1070 is more bandwidth limited than the GTX 1060, because the GTX 1070 has 50% more cores than the GTX 1060, but only has 33% more VRAM bandwidth than the GTX 1060 - this would mean that I would see more performance benefit by increasing the bandwidth of my GTX 1070 than I would with a GTX 1060; also my GTX 1070 is factory overclocked on the core and during this testing was in the 1975Mhz zone, which again would help show any possible gains through VRAM overclocking in the best light. Given that I only saw a 3% performance improvement with a 10% VRAM overclock on my GTX 1070, then you'd expect even less performance increase from this new variant of the GTX 1060. You would see bigger performance gains in games that are very intense on VRAM bandwidth (not sure which ones those would be), but I would be surprised if any gains in such situations would be more than say 5%, especially seeing as the GTX 1060 is not VRAM bandwidth starved in relation to it's relatively weak number of core processors. Seems like a pretty irrelevant relaunch of the GTX 1060.
it's not a question of year... it would be, if maker have the choise of GPU and right now there is none in this segment of the market, so they tried to make new with old and get some few horsepower. On other hand GTX 1060 does it pretty well for the price and is less expensive than equivalent from AMD then why don't use it despite the original release date? it's 2016 again, because you get pretty much the same card for the same price as in 2016. It is clearly an option to upgrade for those who wish to play simple with old dated gpus. GTX series of 780, 780Ti, 950, 960 and 970 from Nvidia. And those with 7850, 7870, 280, 290 and 380 from AMD.